On September 9, 2004, the New-York Historical Society opened a giant exhibition entitled “Alexander Hamilton: The Man Who Made Modern America.” This splendidly splashy exhibit celebrated Hamilton as the founder of the American capitalistic financial system. As the exhibit travels the country once it closes in New York at the end of February, 2005, we will see how Hamilton is perceived by the great American public. [And this past year the musical “Hamilton” has made a huge splash]. Who was this man who causes such a stir two hundred years after his death? None of us who have waded through the 800-page biography by Ron Chernow can say that we are uninformed about the facts of his shockingly brief life. Hamilton was born on Nevis, British West Indies on January 11 in 1755. His parents were James Hamilton, the fourth son of the laird of Stevenston on the west coast of Ayrshire in Scotland, and Rachel Faucett Lavien, the daughter of a Huguenot physician and an English lady. Hamilton’s parents were not married; Rachel had been married off at sixteen, was very unhappy and fled to St. Croix, abandoning her husband and their son. The divorce laws of the day gave him the right to remarry, but forbade it to her and designated whatever property she owned should go to the legitimate child. James Hamilton, an unsuccessful merchant and unsteady character, first lived with her as her husband but then abandoned Rachel and the two Hamilton boys. She died when Alexander was thirteen, leaving Alexander thirty-four books and almost nothing else. The authorities on St. Croix, summing up the abilities of the Hamilton boys, apprenticed young James to a carpenter and Alexander to a merchant house as a junior clerk. He was fortunate to be employed by the Crugers, a family of Dutch origin who had offices in New York City, in Bristol, England, and in the West Indies. They appreciated his precocious abilities, leaving him in sole charge of the mercantile business at the tender age of fourteen. He also attracted the attention of the Rev. Hugh Knox, a Presbyterian clergyman. The Crugers, Knox, and representatives of his mother’s family, banded together to raise enough money to send him to the British American mainland, with the idea that he would study medicine. Rejected by the College of New Jersey (later Princeton) because he wanted to study at his own accelerated pace, he was accepted by the staunchly conservative and anglican King’s College (later Columbia). Never neglecting his studies, he became a brilliant pamphleteer on the side of the natural rights of the colonists. Alexander spent his last allowance money on the dashing uniform of the captain of a private artillery company — green, with “Liberty or Death” on the caps. He began his war by seizing cannon on the Battery at the foot of Manhattan while under bombardment by a British warship. By March, 1776, he was appointed captain in command of the New York Provincial Company of Artillery. In August, he fought in the Battle of Long Island, which began the retreat from New York. Some time in September, at Harlem Heights, he attracted the attention of Washington. He fought as an artillery officer at White Plains, Trenton and Princeton. On March 1, 1777, Washington appointed him aide-de­camp, with the rank of Lieutenant Colonel – basically chief of staff at the age of twenty-two. He was with his chief at Valley Forge and, as 1778 began, he started to write brilliant position papers that showed a clear grasp of the problems of running an army under a weak confederated government without true powers of taxation. Even at this early stage, he was thinking of a constitutional government with taxing powers and a proper executive. On December 14, 1780 at General Philip Schuyler’s mansion at Albany, he married Schuyler’s second daughter, Elizabeth. They were to be the parents of eight children. With this marriage, he secured himself a place among the great Dutch families of the Hudson valley and tied his future to New York. Unfortunately, he inherited the Schuyler and Livingston family quarrels with the Clinton political dynasty. These were to dog his entire political career. On April 30, 1781, at Morristown, New Jersey, desperate for a field position, he resigned from Washington’s staff — having served for four years. Washington never held a grudge against the man he called “Alexander my boy” and gave him the honor of leading the assault of Redoubt Number 10 at Yorktown. His personal war service complete, he turned to the law, and with his usual staggering efficiency completed a year’s study in three months. When the British finally evacuated New York City in November, 1783, he set up his practice and rapidly became known as the most brilliant attorney in the city. Never venal, he was always concerned with financial systems and structures. In 1784, he helped found the Bank of New York. Conscious of the evils of slavery since his boyhood in the Caribbean, in 1785 he worked with John Jay to found the New York Society for the Manumission of Slaves. He was a man with a clear vision of the necessity to prepare and pass a constitution to form the structure of that new society, the United States of America. He spent 1787 and 1788 arguing for a government with a strong central executive. On October 27, 1787, he published the first Federalist. Altogether, there were to be eighty-five Federalist Papers, fifty-one attributed to Hamilton, twenty-nine to Madison, and five to John Jay, altogether 175,000 words written in seven months. In one burst of creative energy, Hamilton handed six to the printer in one week. This prodigious labor resulted in the ratification of the Constitution. Hamilton was the only signer from New York. Hamilton was to be killed in a duel with Aaron Burr, a skilled politician, but not a philosopher. His real philosophical antagonist was Thomas Jefferson, whose vision of America was a land of white yeoman small landholders, living in bucolic harmony, far from the bustling metropolis. There is no evidence that Jefferson ever thought how the country would pay for this pastoral idyll. Hamilton’s vision was very different; he was an urban financier to his very core. When George Washington was duly elected the first president under the newly minted system, he turned to Hamilton as his first Secretary of the Treasury and Jefferson as his first Secretary of State. Hamilton, in less than two years, while running the largest department in the government – thirty-nine employees – turned out three brilliant reports. The first Report on Public Credit insisted that the government should assume its debts at the full rate. His plan for a national bank caused the first constitutional crisis; The Virginians lined up behind Jefferson in opposition and put extreme pressure on Washington to veto it. Hamilton turned out a 15,000 word treatise in just over a week. As Eliza Hamilton remembered it in her old age, “I sat up all night, copied out his writing, and the next morning, he carried it to President Washington and we had a bank.” The third was the Report on Manufactures, which was coupled with the charter of the Society for Establishing Useful Manufactures. Unfortunately for Hamilton personally, and for the country, he, became involved in a sordid love affair in the summer of 1791 and while still providing tremendous services to the republic, he became more and more vulnerable to his enemies. In January, 1795 he resigned as Secretary of the Treasury. In the summer of 1796 he performed his last service to Washington by preparing his Farewell Address. In July 1798, he was appointed Major General and Inspector General of the Army. On December 12, 1799, Washington wrote his letter – to Hamilton. 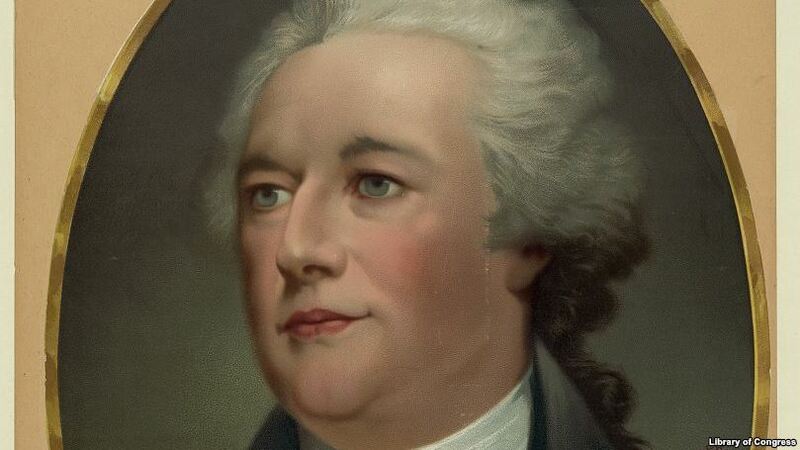 When Washington died a few days later, Hamilton lost his greatest protector. Hamilton sowed the seeds of his own destruction in February, 1801, when Jefferson and Aaron Burr, running for president, tied in the House of Representatives. After thirty-six ballots, Hamilton urged his followers, the members of the embryonic Federalist party, to vote for Jefferson. Hamilton felt that, despite their philosophical differences, Jefferson was honest. Burr, he felt, was unprincipled. In November of that year his eldest son, Philip, was mortally wounded in a duel with a Burr supporter who had insulted his father. Hamilton’s eldest daughter Angelica went mad from the shock and never recovered. Hamilton vowed that he would never seek to kill another person, but he stalked Burr relentlessly in writing and in speech. On July 4, 1804, Hamilton and Burr marched in the Independence Day parade in New York City as members of the Society of Cincinnati (Hamilton had succeeded Washington as president.) On July 11, the two men met at the dueling grounds at Weehawken, New Jersey. Hamilton fired in the air. Burr shot to kill and did. Hamilton expired after thirty hours of agony. He was buried with full military honors in the churchyard at Trinity Wall Street, next to his son Philip. Fifty years later, after a life full of philanthropic good works, his beloved Eliza joined him.